Now there’s a Grammar Express designed just for beginning and low-intermediate students! 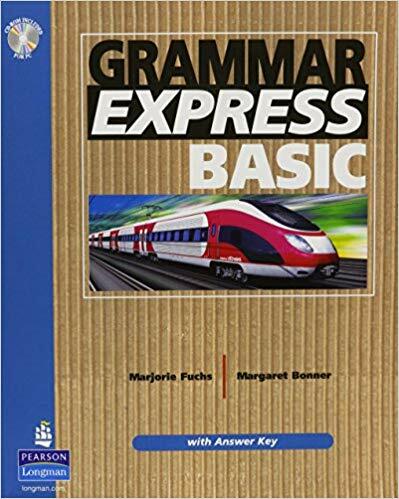 Appropriate for self-study or classroom use, Grammar Express Basic uses highly controlled vocabulary, abundant illustrations, and slower pacing to quickly bring students up to speed. The program’s concise, four-page units present and practice grammar points in context, using topics of interest and relevance to learners. Clear grammar charts with explanations, examples, and usage notes illustrate how English speakers use each grammar point. A variety of contextualized exercises progress from simple to more challenging, while frequent opportunities for assessment keep readers on track for success. Additional support includes Appendices with helpful lists and information, an Answer Key, and a Glossary of grammar terms. Interactive CD-ROM provides additional practice including listening and speaking. Workbook extends the Student Book practice with two pages of additional exercises per unit. This two-volume series combines a concise, easy-to-follow format- two pages of presentation followed by two pages to practice – to quickly bring English language learners up to speed.